Ipswich and Charlton's respective hopes of reaching the Championship play-offs and avoiding relegation were dented in a goalless draw at Portman Road. A game of few chances saw Charlton go closest late on when Bartosz Bialkowski denied both Ademola Lookman and Yaya Sanogo with a sharp double save. 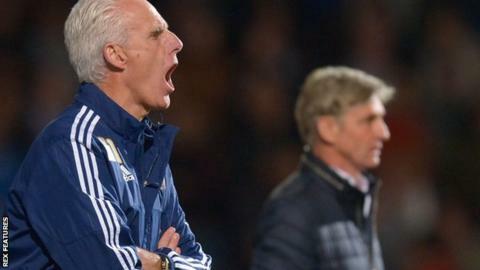 Ipswich failed to score for a third successive game as they slipped seven points behind the play-off places. Charlton stay second from bottom and seven points adrift of safety. Mick McCarthy named an unchanged Ipswich starting line-up but saw his side equal their longest goal drought of the season. Charlton were unable to build on their home win against Birmingham on Saturday and results elsewhere saw them fall a point further behind in their attempts to beat the drop to League One. But Jose Riga's side kept Bialkowski the busier of the two goalkeepers on the night. As well as Lookman and Sanogo's late efforts, Jorge Teixera had a near post header tipped over the bar in the closing moments of the first half. Callum Harriott also proved a handful throughout for the Ipswich defence. Ben Pringle had the home side's best effort when his rasping first-half shot from outside the box was tipped behind for a corner by Nick Pope. "It was a difficult game with neither side doing enough to win it. Both had chances and why they are in the bottom three, heaven only knows. "They are a pretty tight unit and we weren't good enough to break that down. "It did neither of us any favours - us trying to get into the play-offs and them out of the bottom three. "We will try and win our next game and win as many as we can and see where that takes us. But we are now in a must-win situation - there is no getting away from that." "You have seen from that performance that we have the drive, will and commitment to fight until the end, until it is mathematically not possible. "But we will need to create a miracle. "We did very well and tried to play football while enduring a tough challenge. We created good opportunities and was strong both offensively and defensively. "The only thing missing was the one goal and we deserved to take all three points. We were not lucky with the other results but we have to keep performing." Match ends, Ipswich Town 0, Charlton Athletic 0. Second Half ends, Ipswich Town 0, Charlton Athletic 0. Corner, Charlton Athletic. Conceded by Tommy Smith. Corner, Charlton Athletic. Conceded by Luke Chambers. Corner, Charlton Athletic. Conceded by Luke Varney. Substitution, Charlton Athletic. Simon Makienok replaces Marco Motta. Jordan Cousins (Charlton Athletic) is shown the yellow card. Attempt missed. Freddie Sears (Ipswich Town) left footed shot from outside the box is too high. Assisted by Luke Chambers. Substitution, Ipswich Town. Teddy Bishop replaces Brett Pitman. Attempt saved. Yaya Sanogo (Charlton Athletic) right footed shot from the centre of the box is saved in the bottom left corner. Attempt saved. Ademola Lookman (Charlton Athletic) right footed shot from the right side of the box is saved in the bottom left corner. Marco Motta (Charlton Athletic) wins a free kick on the right wing. Attempt blocked. Ademola Lookman (Charlton Athletic) right footed shot from outside the box is blocked. Assisted by Yaya Sanogo. Substitution, Charlton Athletic. Igor Vetokele replaces Callum Harriott. Corner, Ipswich Town. Conceded by Jorge Teixeira. Attempt blocked. David McGoldrick (Ipswich Town) left footed shot from outside the box is blocked. Assisted by Luke Varney. Attempt missed. Callum Harriott (Charlton Athletic) right footed shot from the right side of the box is close, but misses to the right. Assisted by Chris Solly. Offside, Charlton Athletic. Marco Motta tries a through ball, but Jordan Cousins is caught offside. Attempt blocked. Ademola Lookman (Charlton Athletic) right footed shot from outside the box is blocked. Attempt saved. Jordan Cousins (Charlton Athletic) right footed shot from outside the box is saved in the top centre of the goal. Assisted by Ademola Lookman. Attempt blocked. Liam Feeney (Ipswich Town) left footed shot from outside the box is blocked. Assisted by Luke Chambers. Attempt missed. Callum Harriott (Charlton Athletic) right footed shot from the centre of the box is just a bit too high. Assisted by Alou Diarra. Attempt saved. Brett Pitman (Ipswich Town) right footed shot from outside the box is saved in the bottom right corner. Assisted by Jonathan Douglas. Attempt missed. Jonathan Douglas (Ipswich Town) left footed shot from the centre of the box is too high. Assisted by Christophe Berra.